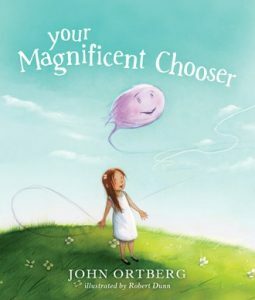 With wonderful illustrations by Robert Dunn, Your Magnificent Chooser shows children how their personal will determines the choices that they make, and — most importantly — the they have control of their chooser! In a world where children are taught that the world revolves around their whims, that they can’t (or don’t have to) control their reactions, Your Magnificent Chooser puts the control of choice back into the child’s hands. Does not get its way? Indeed, what happens when you don’t get your way? Or you experience conflict with others? Or you’re just plain tired? Ortberg helps explain it all in this book. I’m looking forward to sharing this book with my daughter when she’s old enough for paper books! I received a complimentary copy of Your Magnificent Chooser from Blogging For Books, but I was not otherwise compensated for this review. All writing, thoughts, and opinions are solely mine.